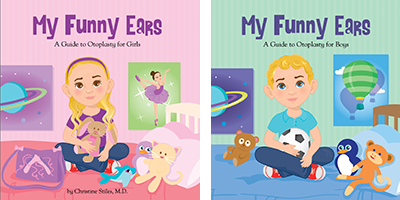 Large protruding ears are often the source of ridicule for many children. This may lead to poor self esteem, difficulty developing friendships, and poor school performance. This congenital deformity is one of the most common deformities of the head and neck. An otoplasty is a procedure designed to reshape the ear to complement the face. 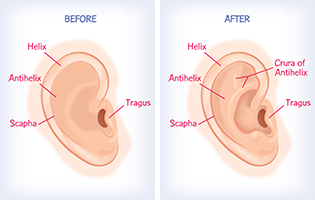 The ears protrude out because the "Y-shaped" bend (called the Crura of Antihelix) of the ear is missing. During the procedure, two cuts are made, one on the front and one on the back of the ear. This gives the ears the "Y" they were missing. Virtually Try On a Procedure at Home! Click the image to order your $9.99 print copy or e-book online.